Welcome, dear readers of my blog and those who are not alien to the world of investments. As I promised yesterday in the chat of your blog in Telegram in this article I will introduce You one promising project, which I recently added to its investment portfolio and, given all its advantages, now expect a good dividend on the Deposit. So, get acquainted with investment platform. "Сashbery". For starters, suggest You look at the site and its preparation for working with potential investors. As You can see, the site has very simple for any user of the Internet. Its sections are filled with information so that every, regardless of age or computer skills, was able without assistance to understand that here to what. All clear, competently, logical and informative. 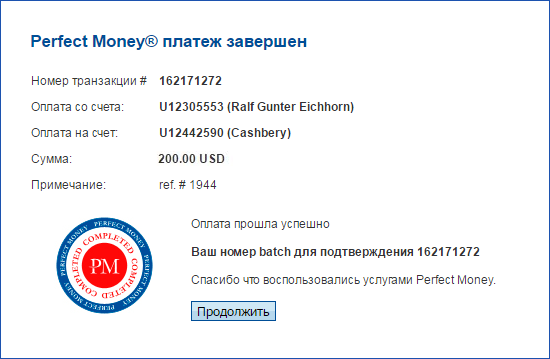 Inherently "Сashbery" is adapted for "Russian man" system of lending to private individuals and small businesses from a British company PRIVATE LIMITED COMPANY "CASHBERY LIMITED". To be precise, the "Сashbery" domestic "daughter" of his high-society English "mother". the Target platform to unite in one place in need of money and those who are willing the money they provide. • Documents on the registration of PRIVATE LIMITED COMPANY "CASHBERY LIMITED". It would be desirable to nitpick, but the documents are all right here therefore, the probability of long-term performance of the Fund increases significantly. 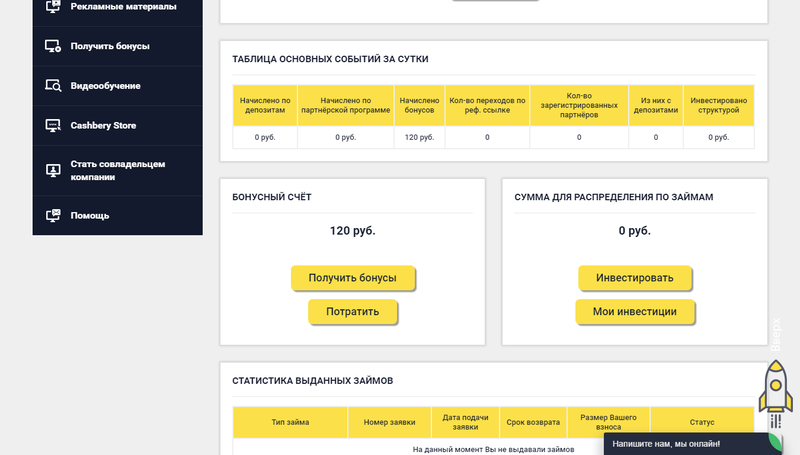 As You could already understand, "Сashbery" provides an opportunity to its users to make loans to other participants or to obtain a cash loan if necessary. And if the second option we are interested is small, then first we will stop in detail. • Loans to small and medium businesses. • Financing against pledge of movable and immovable property. 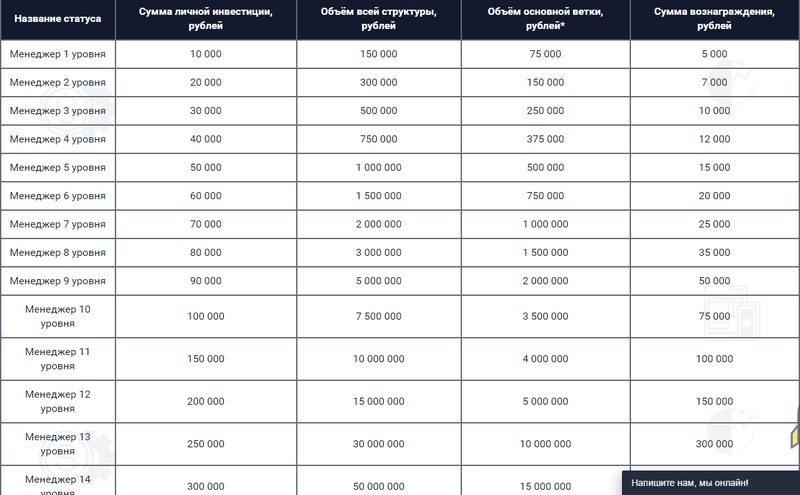 Each of these categories contains another 3 sub-categories, but at the moment development for each kind of investment is available for 1 rate plan. The first rate – it "Luxury" from "Microloans to individuals". I must say that it is suitable for investors with any size portfolio. 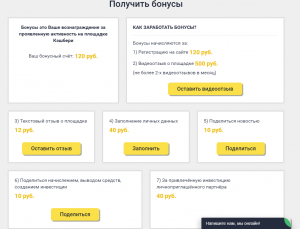 The minimum Deposit amount is 1000 rubles, and the maximum is limited to 29.999 rubles. 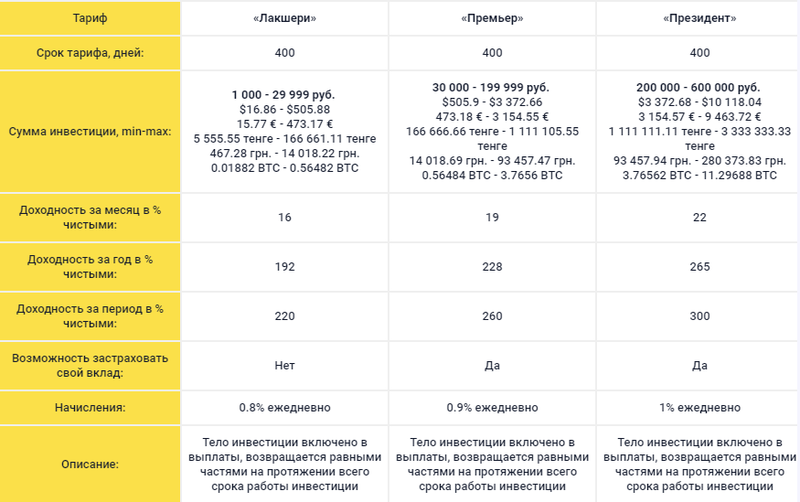 According to the terms of this package, You on a daily basis for the 400 will receive the charge on 0,8% of the amount of the contribution that at the expiration of term investments in the amount of 320% payments from 100% - is the body of Your contribution and 220% net profit! 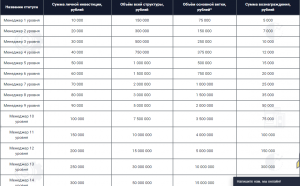 Second rate "Prime Minister" from the group "Loans to small and medium business" has the same working principle but differ in the range of deposits (here it is from 30,000 to 199.999 rubles) and the total profit, which will amount to 260%. As a consequence, increases and daily interest accrual, here it is 0,9%. "President" - the third rate of the group "Financing against pledge of movable and immovable property". 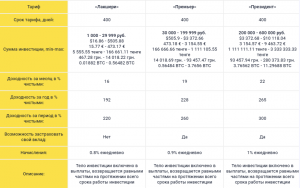 As you might expect, it is the most profitable (300% profit to 1% daily), but also the most "difficult" for the investor, since the level of investment here is set at 200,000 rubles. in addition, I note, for plans "Prime Minister" and "the President" is available insurance contribution from force majeure, which is quite an attractive feature. 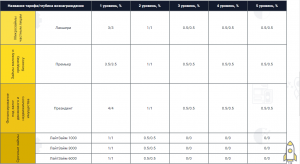 There are more rates, which are activated in the presence of the term loans in the system "Сashbery". They bring a 7.67% charges per day for 15 days that the outcome will be 115% refund. One thing that You should know: the first accrual of profit occurs 48 hours after making a Deposit. There is a good opportunity to increase their current assets by engaging in the "FundСashbery" new partners. Initially, it should be noted that the size of the partner's remuneration will depend on the tariff you choose You have invited people, and the referral fee is paid 50/50: 50% You and 50% equal parts of each dividend to Your partner. *In the picture these dimensions as 3/3, which means 3% from 3% while dividends are credited to Your partner. I, for facilities withled all in one digit. For term loans, the structure of affiliate accrual is 2 levels deep with the reward 1%0,5% of the amount of the Deposit referrals according to their level. But this is not all, "cookies" of the Fund. There are also good, in my opinion, motivation system titles and ranks, following which, you can get a reward of up to 500,000 rubles. I dwell I will not, because it's very long, and just give You the motivational conditions of the program in graphical form (there will be questions – write on e-mail or in chat, I will answer You). All of these factors, in combination, provide just elegant tool for making money. "Сashbery" well motivates each of its members to engage with partners that, in turn, a very positive effect on the financial position of the platform, and therefore on the earnings of users. A good and Arsenal payment methods. 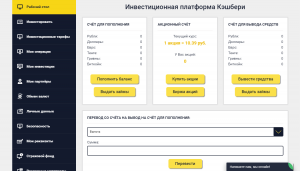 In the platform "Сashbery", along with such EPS as PerfectMoney, Bitcoin, Payeer, AdvCash, OkPay, Yandex Money, the Qiwi, NixMoney is present and withdrawal to the Bank account Sberbank, Alfa Bank, WORLD, GenBank, TCS, PSB, VTB24, Russian Standard. Withdrawal from the project "Сashbery" is on Fridays from rules 72 hours. Withdraw the same amount you $1 or 60 rubles EPS 100 roubles on the Bank account. Also fee is charged for payment: EPS – 0,5%, banks – 2% of the requested amount. The project dashboard is chock full of information. To be honest, at first I thought that I'll be a long time to understand, but no, were all very easy. 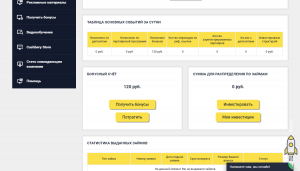 So, in addition to traditional tools (to create a Deposit, to request payment, view statistics, get your referral link, etc) here You available learning materials, the purchase of shares of "Сashbery", bonus and store "Cashbery Store". 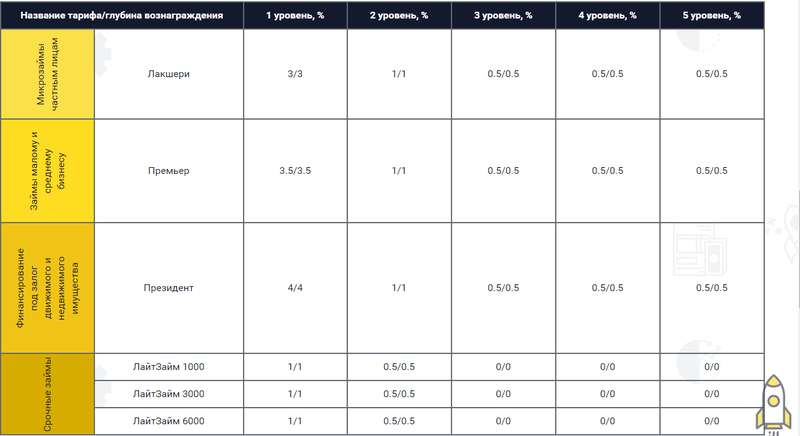 Let's briefly look at the bonuses and share purchase "Сashbery". Purchasing securities "Сashbery" You become "owner" of the Fund. Actions as any of the securities may fluctuate in price, and that You can earn. In any case, now the cost of 1 share is 10 rubles, and in the future, who knows, maybe more than 1000. What to do with it is up to You. I just have such an opportunity. Bonuses are given to any user for his activity (something like those that I have on the blog). For example, for signing up You will receive 120 rubles video review of 500, for the repost withdrawal 10 rubles and so on. These bonuses are You can spend to pay 50% the value of the goods in the "Cashbery Store". It remains to mention the support of users and you can finish your review. 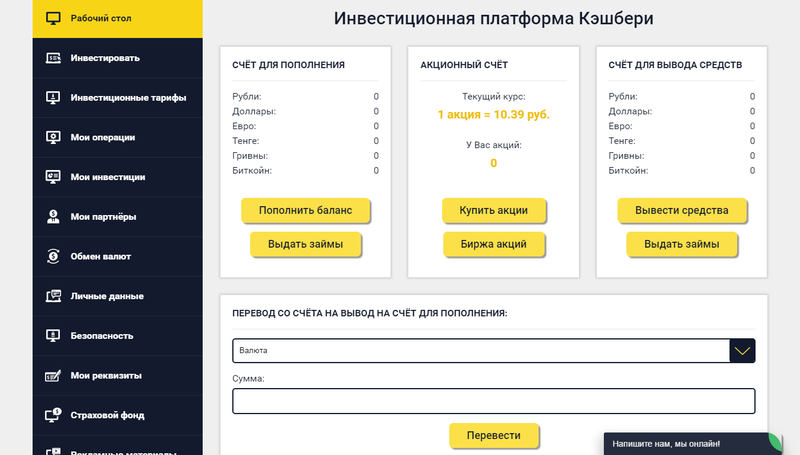 On the website "Сashbery" in the section "Contacts", You will find the addresses of the offices of the company, address, e-mail administration, telephone hotline, and links to groups in social networks. This is more than enough to ensure uninterrupted support professional participants of the "Сashbery". Of course, I will not describe all the information that is on the website as we don't want to inflate the article to the size of the scientific employee of a research Institute. On the website besides all that I mentioned, there is still a lot of information and educational materials that will help all participants to understand its benefits and opportunities. I think You'll be able to choose what to see, what to skip past the eyes. That's it for me. Waiting for Your opinions about the Foundation "Сashbery" in the form of comments and discussion in the chat my blog on Telegram. Администрация кешбери сообщила, что до 2 января нужно заполнить корректно все данные в личном кабинете , другими словами пройти верификацию . Во многих проектах такого плана предусматривается верификация, думаю в этом нет ничего страшного, просто создают видимость легальной работы. Учитывая то,что работают они давно и через многое прошли,тем более верификация не требует паспортных данных,то это сообщение в качестве информации. в конце были проблемы с возвратом. На реферальных и в кешбери круто зарабатывают. Ааа,ну заблокировали именно из-за нарушений условий. Так и некоторых лидеров,в том числе и пельменя. Я в делстоне паспортные данные не помню чтобы давала. В кешбери хорошо хоть не сбор данных идет. У фаира есть проект на мониторе,там чтобы вывести,нужна верификация с паспортом. На удивления все измения и дополнения пока идут проекту на пользу и действительно хоть и пришлось получившим прибыль оплатить страховку,проект продолжает платить и это радует. Да, видно у руля здесь опытные админы, знают как вырулить ситуацию, респект им! Проект продолжает и радовать и огорчать. Радовать потому что платит и переваривает крупные депозиты,а огорчает,потому что платит и правда только тем,кто после получения 50% прибыли заплатил страховку 30% депозита. Но главное что не в минусе. конечно, то что прибыль это уже прекрасно! А сам проект удивляет своей живучестью. Как оказалось действительно кто оплатил страховку в проекте, тому выплаты продолжаются,кто не оплатил,аккаунты заблокированы. Явно ввели такие жесткие условия не от легкой жизни,но по крайней мере они стараются и тянут. Да, решение нестандартное и казалось бы должно было отпугнуть некоторых инвесторов, но все продолжает работать и приносить прибыль. Так что молодцы команда проекта! Только сейчас тема пулов в проектах стала очень популярной на этом блоге,что не может не радовать. Намного меньше рисков при наиболее высоких процентах. Проект безусловно гигант,но внедрение в уже отработанную систему сомнительные на мой взгляд условия, думаю ни к чему хорошему не приведут. Сначала ввод комиссии на вывод,сейчас страхование вклада для сохранности его после отработанных 50%. Честно говоря при таком развитии без этих двух пунктов проект мог вполне бы проработать. Думаю они не просто так ввели эти пунткы, таким образом отсеяли многих инвесторов, недополучивших прибыль и тем самым снизив нагрузку на кассу. Условия они выполняют, так что их совесть чиста. 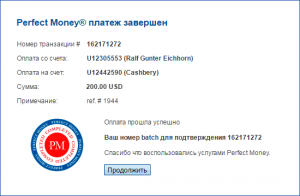 03.24.17 14:17 Received Payment 1.73 USD from account U13546752. Batch: 169987993. Memo: API Payment. cashbery. 02.24.17 06:47 Received Payment 1.75 USD from account U13546752. Batch: 165707867. Memo: API Payment. cashbery.